Matte Finish Coating, Elastomeric Acrylic | Nationwide Coatings Inc.
WHAT IS ACRYLOSEAL™ SMOOTH ELASTOMERIC CERAMIC MATTE FINISH COATING? ELASTOMERIC acrylic insulating ceramic waterproofing smooth finish coating. 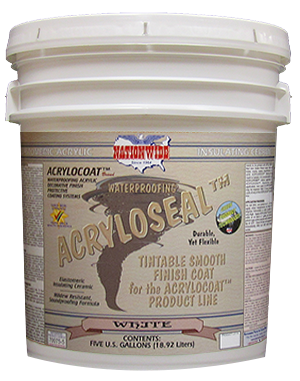 Final colored coat for the ACRYLOSTUK™, ACRYLOSAND™ and ACRYLOTEX™ systems. Weight per Gallon: 11.8 lbs. Light Gray Elastomeric Waterproofing Adhesive Bonding Primer Sealer. Tacky Finish Provides a Tight Bond to Elastomeric & Acrylocoat™ Coatings. 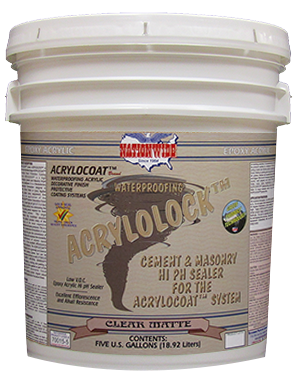 Clear Acrylic Primer Sealer & Surface Conditioner that Prepares Most High pH (Fresh Cement/Stucco) & Chalky Surfaces. Elastomeric Waterproofing High Solids Trowel or Brush Grade Roof, Wall & Floor White Caulk & Sealant. Minimal Shrinkage. Elastomeric Waterproofing Insulating Ceramic with Urethane. Maximum High Load Ceramic Content. Use as Matte Finish Coat or as a Performance Upgrade Mid-Coat.